Stay on track with this stylish, easy-to-read round wall clock. 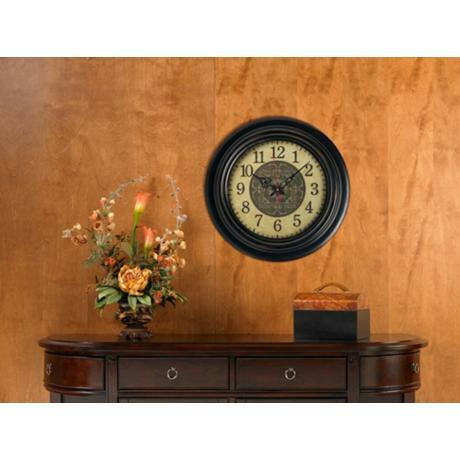 This wall clock combines the best features of traditional and contemporary styles. The center of the clock face features a traditional pattern in a silhouette while the alpha numeric numbers are easy to read. The red second hand is a lively contrast to the beige and walnut colors. - Beige and Walnut finish. - Battery operated. Alpha numeric numbers. - Extends 2 1/4" from the wall.